Whether you’re an educator, musician, public speaker, or audiophile, powered speakers are one of those things you’ve just got to have. However, choosing a good PA speaker from all the mediocre ones can be challenging, especially with all the technical language and specs that get thrown around. Whether you know nothing or everything about powered speakers, this list is meant to guide and help you choose the right one for your needs. Without further delay, here’s 20 of the best powered speakers available to you right now. You may or may not have heard of Klipsch before now, but odds are you won’t soon forget about them. Their R-15PM Powered Speakers have a minimalist yet sleek design, with high-efficiency amplifiers that pump sound far and wide. The speakers also have both a low and high-frequency driver, which ensures a consistently full range of sound. They slip into any area and can be hooked up to your TV, computer, turntable, and most other devices, including BlueTooth enabled devices. Furthermore, these speakers can easily be controlled from the comfort of your chair, thanks to the IR remote control. This allows you to get the perfect track and volume at the press of a button. At this point, we’ve taken you from some of the quality lower end speakers all the way to a more high-end, completely self-contained wireless speaker system worthy of any audiophile’s rig. The KEF LS50 is all you need for high fidelity, game-changing sound, with a 5.25″ low-frequency driver, 1″ dome, and 200-watt amplifier. The LS50 is also BlueTooth compatible and has an 8-device memory, so connecting multiple devices is a breeze. Perhaps best of all, these speakers are directly compatible with Tidal, Spotify, and Roon, so you don’t even have to set up BlueTooth if you use one of these streaming services. Lastly, these speakers are available in various finishes, so you don’t have to settle for anything you don’t love. The M-Audio M3-8 is a simple yet near-perfect studio monitor. What makes it such a worthwhile find is the fact it’s a 3-way monitor, and a superbly constructed, one at that. A three-way monitor has a few advantages over a 2-way. First, it’s louder. The large 5″ driver is able to pump more power through the tweeter without using more power, so it’s louder than other speakers with the same input power. Having a 3-way monitor also means you have more support and the speaker is less likely to get damaged or stop working. With 3 drivers, the tweeter doesn’t have to work extra to pick up mid-range frequencies, meaning it can be used for a longer amount of time than a 2-way speaker without experiencing burnout. And finally, the M-Audio M3-8 features wide-angle dispersion, delivering sound that can fill your entire studio. Yamaha has been in the audio game for a while now, so it’s no surprise that they have one of the best powered speakers to buy right now. The Yamaha HS8 features a bi-amp system that is sure to please. It contains a separate amplifier for both the subwoofer and the tweeter, which helps keep the sound consistently crisp and prevent it from falling flat. The HS8 is an improvement on previous models and boasts several upgrades, including a larger tweeter, more customizability, and a new and improved amp unit. The enclosure was also specially designed to deliver the best sound. They are constructed from dense fiberboard because of its damped acoustic response, which eliminates annoying resonance and makes for a more enjoyable experience. The ELAC Debut 2.0 B6.2 ensures you don’t miss a thing, with a 1″ silk dome tweeter and a 6.5″ subwoofer. These speakers give you that punchy bass you love, without letting it drown out all the other nuances of a song. The thick cabinet walls are also internally braced to help reduce resonance, giving you a crisper, cleaner sound. You can make this purchase knowing it’s protected in several ways. Not only are there 2 grills included with the speakers to protect the internal components, but it also comes with a three-year warranty and a 60-day money-back guarantee. So, you’re protected in the short term and long term. These sleek bookshelf speakers from Audioengine are perfect for any setting. Whether they are sitting beside your turntable or completing your living room entertainment system, these speakers are some of the best out there. They feature built-in power amplifiers and custom Kevlar woofers, but that’s just the beginning. If versatility is what you’re after, the Audioengine HD3 has all you could ask for. Multiple connects allow you to use these speakers any way you please, whether you want to control them wirelessly using BlueTooth, hook them up to your laptop with a USB cable, or using any aux cable. No matter what you choose, you’re guaranteed to get high-quality sound, not to mention the beautiful walnut finish. The A5+ speakers provide amazing sound, thanks to the two built-in amplifiers, custom Kevlar woofers, and silk tweeters. People love the powerful bass of these A5+ speakers because it sounds authentic and not over exaggerated. Another great thing about these speakers is everything you need comes in the box, including the two speakers, a remote control, speaker wire, detachable power cord, mini-jack audio cable, RCA to RCA audio cable, cloth speaker bag, and setup guide. As you can tell, there are multiple ways to hook up these speakers, which allows you to get the most out of them. These powerful little bookshelf speakers perfectly compliment any space and lifestyle. Whether you listen to music on your iPhone, Android, Mac, or PC, you can hook it up to these speakers. You can even use these speakers in an entertainment room since they easily hook up to TVs and DVD players as well as any Bluetooth device. Now, what everyone really cares about. These Plugable speakers feature two high-quality drivers, a 4″ woofer, and a 1″ silk dome tweeter, giving you everything you need to enjoy a wide range of frequencies. Best of all, they come at a very affordable price, outperforming virtually all other speakers in its price range. 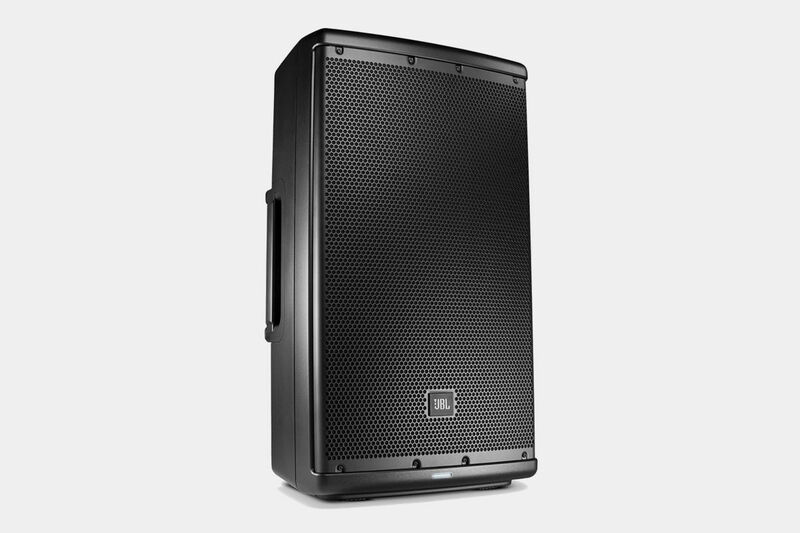 If you’re looking for a powered speaker that can travel throughout a large gymnasium or auditorium, you’ll want something like the Behringer Eurolive B210D. Its built-in class D amplifier provides the booming sound necessary for any good assembly or stage performance. This Behringer speaker is sold one at a time, instead of in a pair, but one may be all you need of these powerful 200-watt speakers. This speaker commands attention and the super quiet mic/ input line ensures you won’t be distracted by any static or buzzing. What’s really impressive is that this speaker can provide booming sound while still having a compact, lightweight housing that‘s easy to move around and set up in any configuration. The Club 3000 from Proreck is designed to carry crisp, clean sound up to 300 square meters. This makes it especially great for events like weddings, proms, speeches, or other performances. The telescoping speaker poles ensure sound can travel through the room unimpeded and can be adjusted from 65 to 80 inches. The speakers themselves are comprised of 8 individual drivers, one passive subwoofer, and one active subwoofer with a 12-inch amplifier. They are also easy to customize and control, with individual bass and treble controls and can be controlled using your phone or other devices up to 66 feet away. The Club 3000 is a fantastic all-in-one speaker set, perfect for virtually any event. If you’re looking to upgrade your current speakers, look no further than the Mackie Thump series. The Thump 15BST is one of Mackie’s best speakers to date and has the specs to back it up. The 1300w amplifiers, which blast every thump of bass with no heavy distortion or distracting rattling. The Thump 15BST also has 6 different modes, making setup a breeze and allowing you to customize this speaker to fit your exact needs. With a 3-channel mixer built into this speaker, you really can’t go wrong choosing it. And it really is perfect for anybody, regardless of where you live, because it’s the only loudspeaker that can be plugged into the wall anywhere without needing any modifications, all thanks to the included Power Factor Correction technology. These speakers may not be able to fill an entire gymnasium with sound, but they make the perfect addition to any home office or music listening space. These Edifier speakers offer two times the auxiliary inputs as regular bookshelf speakers, so you can hook up two devices at once without ever having to unplug or disconnect one. These speakers can also hookup to DVD players, Blu-ray players, and almost all TVs, making it perfect for home theaters as well. In fact, the special “eagle eye” silk dome tweeters make it perfect for home theaters because they pick up every little sound, so you can clearly hear every detail and even background noise of whatever movie you’re watching. Going a step further to provide high-quality sound, these speakers also include built-in Digital Sound Processing and Dynamic Range Control to eliminate any distortion. The Mackie Thump 12A is another great speaker from the Mackie Thump series, with fewer bells and whistles and a much friendlier price tag than the 15BST. Many argue this speaker doesn’t need all the bells and whistles because of its clever, dual angle design. It also boasts, among other things, a 12-inch subwoofer worthy of any performance. A good powered speaker will have a way to ensure consistent results, but many don’t. That may be why you experience power problems with your current speaker, but thankfully this Mackie speaker has a way to prevent unstable AC power problems. It features Power Factor Correction technology, which ensures your speakers are getting the correct amount of power and you’re getting the high-performance power you need from them. Bose is one of the most well-known and widely loved speaker companies, and not without reason. Their PC speakers are some of the best and make the best finishing touch on any PC setup. The Bose Companion 2 Series III speakers are perfect for any PC gamer, YouTube watcher, or student. They put out crisp, high-quality sound, even when you turn it all the way up, which is rare in PC speakers. Additionally, these speakers can connect to more than just a computer. They have an additional aux input, so you can connect just about any device. These Bose speakers are also very easy to set up and control, making for a relaxing and enjoyable music listening experience from beginning to end. This remote controlled DJ/PA speaker packs a big sound into a small package. This speaker delivers an impressive 600 watts of peak power, which may not seem like a lot when compared to some of the other speakers on our list which pack a few thousand watts, but the sound from these speakers is impeccable. Rockville raised the bar, making small improvements on virtually every aspect of your “conventional” powered speaker to deliver a powerful yet affordable PA speaker that is good for more than just personal use. Although there are plenty of input and output outlets on the back of this speaker, you can go totally wireless if you prefer. This speaker has Bluetooth capabilities and can be controlled using any Bluetooth enabled device within 32 feet. If you’re looking for a totally self-contained PA system that won’t totally wipe out your bank, this may be it. On top of having integrated Bluetooth technology, this speaker also features JBL Waveguide technology, which is what gives you consistently great sound. The smart engineering and attention to acoustic sciences also lend a hand to producing high-quality sound. Musicians may find this speaker especially useful because it’s a complete, compact system, so you don’t have to carry around several pieces of speaker equipment. The speaker itself was also designed to be ergonomic and easy to move, so traveling with them is simple. This JBL speaker can also be set up in several different configurations and even stacked, so you can play around with them to find your perfect setup. Kanto is a relatively new company, although they already have many fans who will vouch for their style, quality, and value. The Kanto YU4 Powered Speakers are perfect for turntable lovers who are looking for a stylish speaker upgrade. The Kanto YU4 features 4″ drivers, 1″ silk dome tweeters and an integrated phono pre-amp. Whether you decide to hook it up to your turntable, phone, or stream wirelessly you still get that rich, clear sound people have come to expect from Kanto. And to finish it all off, it comes in a very sleek customizable housing. These speakers are available in bamboo, gloss and matte black, gloss and matte white, gloss red, gloss teal, and matte grey, so it’s easy to color coordinate with any turntable setup, modern or vintage. Instead of having to choose between high and low-end frequencies, this speaker can flawlessly pick up and process both, thanks to the two different types of power amplifiers. The Class D amplifier is perfect for the low-frequency driver, while the Class AB amplifier powers the high-frequency driver, giving you every note exactly the way it was intended. Another really cool thing about the PreSonus AIR10 is the fact that you can change the settings by just pushing a button. This allows you to fine-tune settings like the bass, treble, and even speech intelligibility. This makes the AIR10 the perfect for DJs since it allows you to set everything at optimal levels for the specific room that you’re in. 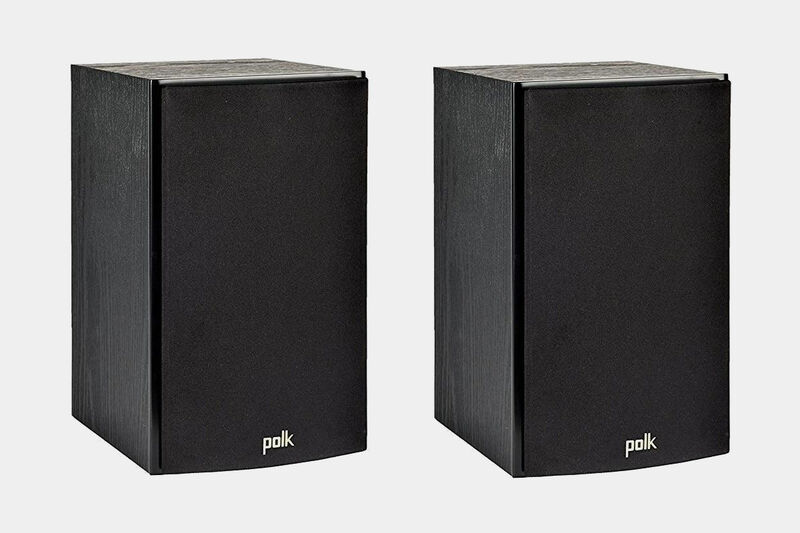 Polk Audio has an impressive lineup of speakers, but the most versatile and portable may be the T15 Bookshelf Speakers. They can easily be set up in almost any space, whether it be on an entertainment center, computer desk, or bookshelf. The T15 puts out rich, crisp sound every time with the help of their Dynamic Balance technology and carefully crafted, resonance eliminating cabinet. This allows you to enjoy your movies, TV shows, podcasts, or music like never before. The speakers are designed to work together to create the best sounding, most realistic, and far-reaching sound possible. Plus, they’re easy to hook up, can be mounted on the wall, and are surprisingly affordable. Not everyone needs a booming PA speaker that’s going to make their whole house shake. If you’re looking for a powerful yet portable, convenient yet reliable speaker, the Philips ShoqBox has got you covered. The ShoqBox has an impressive 30 watts of power, that supply the clear, radiating sound, and two bass radiators, to take the already thumping bass up another notch. Although the sound may not be able to compare to very high-end speakers, it still produces satisfying, high-quality sound, and in some pretty unconventional settings. The ShoqBox is waterproof and shockproof, so you don’t have to think twice about taking it with you in the shower and finally jamming out in the shower the right way. As an added bonus, the built-in LED lights pulse with the music, creating a mini light show that is perfect for parties.